Oil performance - what it is and how it's measured. Is One Oil Better Than Another? What can I use this oil for? Which oil is suitable for the different types of equipment? Is one product better than another? A number of international organizations govern the classification of oils. 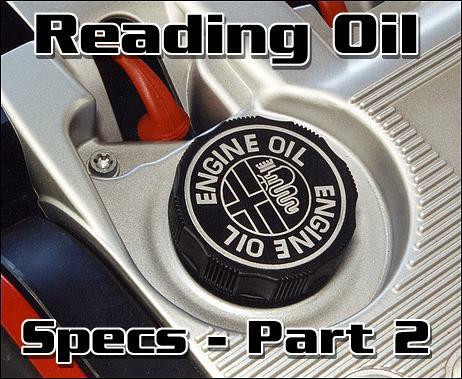 This article will discuss two of the better known ones: the International Standard Lubrication System (ISLS) relating to industrial oils, and the American Petroleum Institute (API) system which deals with automotive oils. The major difference between the two is that the ISLS details the application of the product, while the API is concerned with application and performance. Broad classification: either 'O' for oil, or 'G' for grease. First sub-classification: a letter denoting the type of equipment for which the oil is suitable, eg 'H' for hydraulic. Second sub-classification: a letter denoting the area of application to which the oil is most suited, eg 'C' for circulation. For example, an ISLS oil described as OHC-68 denotes the following: Oil (broad class), Hydraulic (equipment type), Circulating (area of application) with an ISO viscosity of 68 cSt. Another example of an ISLS oil is OCA-46 which indicates Oil, Compressor, Air with a viscosity of 46 cSt. The oils in each of these classes come in a variety of viscosities. The viscosity which is selected is determined by the specific application and the type of component under consideration. The OTA class of oils for automatic transmissions does not have specific viscosity grades attached to it. In this case, the various property classes describe the operational characteristics of the transmission. Drums of industrial oils with the ISLS classification also bear a symbol depicting the class of the oil. For example a drum of OCR-68 carries the symbol of a penguin - an apt illustration for a refrigeration compressor which operates in a cold environment. Oil viscosities are also colour-coded. The most commonly used system of automotive oil classification was developed by the API in the 1930's and is based on the United States military system of oil classification. The API system broadly describes gear and engine oils and then classifies them according to their performance characteristics. All engine oils should have a specification printed on the can. The most common is the API specification but there are others in use. For example Castrol GTX meets the API specification of SF/CD but can also be specified by the South African equivalent, SABS 1361, or the European CCMC G2/PD1. Be very wary of a product that bears no specification. What Does 'Performance' Mean And How Is It Measured? The API system (and others) originated when the engine manufacturers started communicating their needs to the oil companies. When an engine oil is blended, many chemicals (additives) are added to the oil. Additives impart certain properties to the oil, enabling it to function in a desired manner when used to lubricate an engine. It is the additives which impart performance. Simply put, the higher the API grade, the more additives the oil contains and the more performance tests it has passed. Two systems are used, one for petrol engines (S) and one for diesel engines (C). The 'S' stands for 'spark' and the 'C' for 'compression' indicating the different ignition methods and not 'service' and 'commercial' as is sometimes thought. A 'T' class is used for two-stroke engines, but will not be covered here. The secondary letter, A B C D, etc. denotes the performance of the oil. The further into the alphabet you go, the better the oil is. An SF oil outperforms an SD oil and a CE oil outperforms a CD oil. Most four-stroke engine oils are graded for both diesel and petrol engines. The best oil for a diesel engine is a CG4 grade and the best oil for a petrol engine is an SH grade. Interestingly enough, although an SG oil has superior qualities to an SF oil, there is basically no difference between an SG and an SH oil for petrol engines. Generally speaking, most oils have grades such as SF/CD where the C class (diesel engines) is lower than the S class (petrol engines). This is because the oil in a diesel engine is far more highly stressed than in a petrol engine. All the lower API grades are now obsolete. If it were possible to obtain an SA/CA oil, it would be a straight mineral oil with no additives at all. Probably the lowest grade oil available today is an SC/CC oil. It is considered to be a 'running in' oil, as it has a low additive level and has not passed the performance tests that other top of the range oils have passed. This is the only time when the x/y letter suffix is the same. Some of the API classifications have a suffix of '4' such as CF4 and CG4 (there is also a CD II specification). The CF4 class of oils was (and still is in some countries) an intermediate classification of high performance diesel engine oil. Although an SH/CD oil is considered better than an SF/CC oil, it does not necessarily mean that the best oil is the most appropriate oil for your engine. If you have always used a lower grade oil, such as API SF in your motor car, and you switch to the new top of the range SH oil, the higher level of detergents and dispersants in the new oil could create problems. These additives keep metal surfaces clean and keep the contaminants (sludge) in suspension in the oil. The lower grade SF oil does not contain as many additives as the SH oil, and causes sludge to build up in the engine and remain quiescent. This is not ideal, but will not cause any serious damage. A change to a higher grade SH oil may shift the sludge, causing the filter to block and go into bypass mode with a resultant engine failure. This may only occur infrequently, but it shows how the best oil might not be ideally suited to your engine. Another example of oil that is 'too good' for an engine is the use of low ash oils in Detroit Diesel two stroke engines. Many of the additives that are blended into engine oils are chemical compounds that contain metals such as zinc and magnesium. The ash content of the oil (derived from the metallic content) indicates the amount of additive present. In other words, the higher the API classification, the more additives are present and hence, the higher the ash content. Detroit Diesel has found that high ash oils (greater than 1.0%) cause deposits to form on the exhaust valve, which can fuse with the valve face at elevated valve temperatures. The result is a burnt valve in the two-stroke engine. Detroit Diesel recommends the use of low ash oils in these engines, because problems could arise if a high ash oil (ie one with a high API specification) were used. In order to grade engine lubricants, engine manufacturers have designed a series of tests to be carried out under scientifically controlled parameters. Most major engine manufacturers are involved and in order for an oil to achieve an API specification, all the tests must be passed to the level stipulated by the manufacturers. These performance tests do not look at the overall performance of an oil, but at specific characteristics of the oil under test. For example, the Caterpillar 1G2 test is used to determine the ability of the oil to protect against ring-sticking, wear and accumulation of deposits under high speed turbo-charged conditions; and the Peugeot TU3 test is used to measure the ability of the oil to protect against valve train scuffing. All tests are defined by the American Society for Testing and Materials (ASTM) which works closely with the API and a third international body, the Society of Automotive Engineers (SAE). The SAE defines the need for a new specification of oil, the ASTM develops the tests and the API defines the new oil category. After discussions in 1992 the API, in conjunction with the Motor Vehicles Manufacturers Association (MVMA) and the Chemical Manufacturers Association (CMA) agreed to introduce a new oil grade: the API SH for petrol engines, which became effective on July 1st 1993. Whilst the engine tests and specifications remained unchanged from the SG oils, a testing protocol was introduced. This protocol, known as the CMA Code of Practice, aims to guarantee product performance through documented evidence that ensures product integrity with different base oils and viscosity grades. In effect, an SH oil is like an SG oil with an ISO 9000 rating. A GL1 gear oil is a straight mineral gear oil with no EP additive, while a GL6 gear oil has a very high concentration of EP (anti-wear) additive. In an automotive application most oils are generally GL4 or GL5. As with engine oils, it is possible to use a gear oil that is too good . Using a top of the range GL6 oil in a synchromesh gearbox could cause accelerated synchro wear due to the oil containing too much EP additive and making the oil too 'slippery' for the synchros to operate properly. * JS Evans B.Sc. works for WearCheck Africa, the leading oil analysis company in Africa serving the earthmoving, mining, freight, passenger transport, rail, aircraft and marine industries, as well as the industrial sector.